Hanoi (VNA) – The Hanoi Railway Corporation put into operation two newly-built trains on January 26 in a bid to meet the high travel demand between Hanoi and Ho Chi Minh City during the upcoming Lunar New Year (Tet). 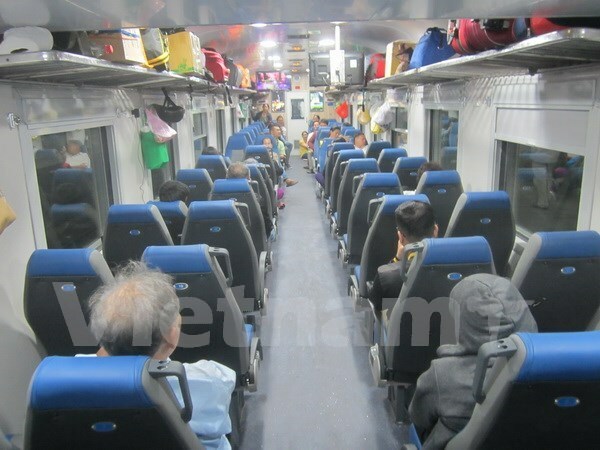 The trains are equipped with modern and comfortable facilities, the corporation’s Deputy Director General Nguyen Van Binh said, adding that the carriages are also insulated to reduce noise. To mark the event, the company reduced the train fares by 30 to 50 percent on the day. The trains, coded SE5 and SE6, are scheduled to stop by 29 stations along the Hanoi-HCM City route during the 35-hour trip. Fares cost 548,000 VND to 1.32 million VND (24.5 USD–58.9 USD). Passengers can buy tickets at railway stations or via e-ticket systems at http://dsvn.vn . The same day, the Sai Gon Railway Company also put into use two new trains on the route from HCM City to Hanoi, which were built under a 65 billion VND (2.9 million USD) project.